Unemployed and just out of school with a shiny but untested sheepskin, I returned home in May 1984 to seek employment. My father Norm graciously let me tag along on a few consulting gigs as I was trolling about for a full-time position. Having barely eked my way out of Virginia Tech (go Hokies! ), the offers were not, ahem, pouring in. However, these were the days of intense FCC attention on computing devices and the market for EMC engineering was heating up and the work, though diaphanous, was pretty steady, if one had a knack for fixing electronic doo-dads afflicted with mysterious and unseen maladies. 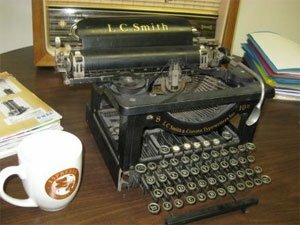 The first task we worked on together was an electronics typewriter-one of its forebears pictured here (no transistors nor EMI problems with this one, tho’). The device we worked on had the propensity to carry on without pressing any keys, losing its way across the page and generating random &#@E!s and $%*#^s, like a fumbled Blackberry message. The problem was a susceptibility to static electricity, or, more properly, the energy produced when the static discharged. The *zap* produces a brief, nasty pulse of energy that can scramble the bits doled out along the wiring and circuits in a computer device. Thing is, back then, no one knew a lot about how this stuff (EMI) affected circuits; well, let’s just say that there was a lot of room between the theory and the “shotgun” approach to solving these problems. We sought a middle ground: a physics-based solutions to the issues. We ultimately fixed the problem, employing our budding skills along with copper tape and fairy dust and as May turned to September that year, I was still at it with Norm. He didn’t seem to mind and we eventually evolved JLN Violette & Associates into Violette Engineering Corporation, moved out of the basement into our first office in Falls Church, VA.
Around that time we had an interesting job protecting the Statue of Liberty from lightning. Well, actually, she doesn’t need much protection, being a giant copper shell on a stainless steel skeleton (armature). 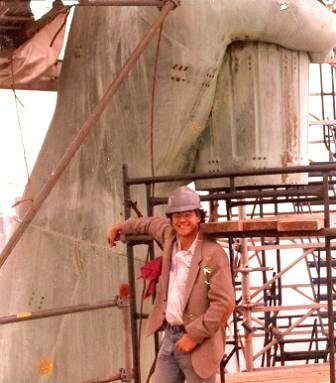 But the work was fascinating, climbing about on the extensive scaffolding that rose 150 feet from the pedestal, an engineering feat in itself that wound about but never touched Bartholdi’s grand creation, checking the grounding and voltage protection circuits for new cameras, lighting and other gadgets. During the restoration, Eiffel’s entire structural steel armature was wholly replaced; and piece-by-piece the old cast iron and leather parts were replaced with stainless steel and Teflon attachments, each individually drawn and replicated. I still have a hunk of the steel used for the armature somewhere. The statue project linked us up with a number of NYC-based clients and, to this day, we do some work mid and up-town, performing engineering analysis and site surveys for data centers, research institutes, the transit system and other clients in that busy environment. Riding up and down the service elevator with the operator drinking a can of Schlitz was a frothy introduction to New York City labor practices. The view of lower Manhattan was phenomenal. The Twin Towers glinted in the bright sun. 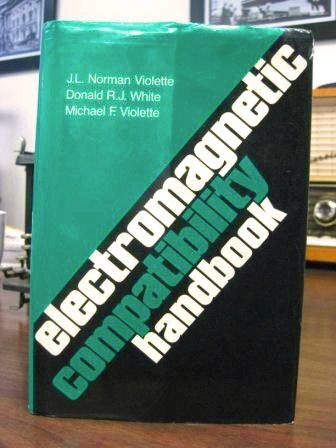 Along about 1987, with Liv’s extensive help, we wrote The Electromagnetic Compatibility Handbook, published by Van Nostrand Rheinhold and pounded out on 5-1/4″ floppy drive, pre-IBM compatible (Northstar Horizon computers running *Wordstar*). Maybe no Pulitzer winner, but it’s on a few shelves here and there. I recommend the chapter on “Antenna Factors”. The EMC Handbook was the beginning of a spate of publishing activities, which carry on to this day, mostly in the form of articles and an occasional travel-blog. So things went during the 1980s as we worked on various problems and noisy dilemmas in various locations: a potato chip factory, research laboratories, hospitals and data centers. Norm taught courses and explained electromagnetic theory in a way that could be consumed without antacid. We developed particular expertise in troubleshooting and design for EMC. All the while, testing laboratories were springing up around the country (and the world) as the evolution brought on by the development of the microprocessor and PC profoundly impacted all of our lives. A mad scramble by everyone from IBM to Apple to Commodore (remember those guys?) to create new innovations pushed the understanding of the very best in the field. Clock frequencies surged past 4.77MHz. RAM exploded to 1024 KB. Hard drives held a massive amount of data (40 MB). How high could this kite fly? We asked. Taiwan emerged from forty years of martial law to become the wellspring of PC clones and electronics development. And then a crazy guy named Sugar walked into our lives. I patted my son on his head and jumped back in the car; you see, those were the days when we turned down no work (kind of like these days). By two a.m., the 125 MHz signal was squished and the PC was passing the FCC requirements. Mr. Sugar was there the whole time, chatting nervously, pouring coffee, ordering Chinese takeout, sucking cigarettes and pacing in and out of the test chamber. We only had ’til the next morning to fix this problem and retest the machine at the FCC’s lab in Columbia. How he wrangled a retest at the Commission was the stuff of whispered intrigue. No one had ever busted the queue. I was to find out that this guy was very persuasive. Mr. Sugar moved quickly to direct motherboards and PCs in our direction, cajoling me with late night phone calls, “Get a lease! Get some equipment! 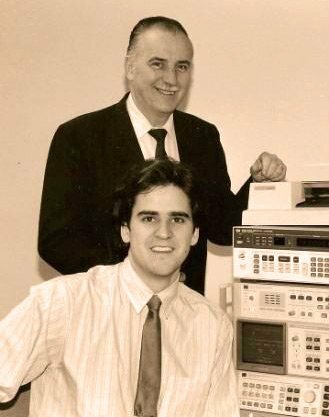 Don’t worry, you’ll have plenty of work!” Starting with a leased Hewlett-Packard Spectrum analyzer and two antennas, we set up in Gaithersburg, MD, not far from where we are today. Working through the 90s with loads of good folks in the I-270 “Technology Corridor,” we rode the CE Marking wave, which brought our first bit of international work. Norm (and mom) traveled to Singapore and Malaysia, making initial forays into Asia and teaching his favorite subject: Lightning Protection. Some other overseas activities included some shielding work in Eastern Turkey (the Kurdish city of Diyabakir) and trips to France to work with laboratories in Paris and Lyon-including the gastronomical and sensory indulgences. Later, China, Taiwan, Vietnam, India.